Setting personal goal is your first career planning step to get a new, perfect career. By setting life and career goals you put your career plan to the next level since your career has an undivided relationship with every other area of your life. You deserve to enjoy a career success and a meaningful life as well. The main idea for this holistic effort is work and life balance. If you don’t know how your career fits into your life and how it allows you to reach other goals you won’t become a total person. 1. The first step of goal setting is contemplate what you really want to be, to do and to have. You may want to find out what you really want out of your life, what you value high and your life’s priorities. Write them down into a personal mission. You can use the mission statement example to create your own mission in life. 2. In setting personal goals you want to follow-up the mission statement with a list of goal areas or categories: health, financial, spiritual, family, career, friendship, recreation, community, education. Except the career area, just add or reduce or even change the name of the areas of the list for setting personal goal. 3. Put a date on your list of goals. Separate ones that you want to achieve in one year and those you aspire to get in more than a year. If you’re really serious in goal setting you can also divide them into three, five, and ten-year goals. 4. 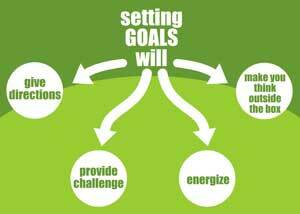 The fourth step in setting personal goals is to find all obstacles that prevent you from reaching your objectives. The obstacles are the required knowledge and skills, or the people you need to know and work with. 5. Develop a plan of action and set milestones for your important goals to make sure you are moving to the right direction. Add reasons for each of your goals because the more reasons you have the more motivated you are to pursue them. Periodically, review your achievements to make sure they align with the goals you truly want out of your life. Check off a completed goal from your goal list and give yourself a pat on the back for each goal accomplishment. If you are persistent in building your personal power for reaching goals, believe me, success is just a matter of time. Remember that your attitudes, beliefs and behaviors determine a successful goal setting and achievement. Negative emotions and bad thoughts hamper personal growth as well as self-improvement and can lead to many physical ailments. On the other hand, positive attitudes have been linked very strongly to achieving goals. A tool like motivational quotes is good for building positive thought for your personal growth. You can use software for setting personal goals and managing goals achievement. Get web-based or desktop software to help you move into action and overcome the most common barriers to goal achievement. I’ve used one for setting and managing goals and it has proven to help me achieve more. Another way to get a significant personal growth is enroll in good personal goal setting courses. A good course usually offers a personal coach who is ready to work with you. He or she can help you to recognize, realize, and achieve your goals, expectations, and dreams. I have personally completed these kind of training programs and already gained benefit in financial, career, and education areas. If you have the right goals, self help motivation is the only thing you will need to achieve the goals. You don’t need professional motivators because the internal motivation is enough for boosting your efforts in achieving goals. However, if you want more predictable results with your self improvement strategy then employing a coach is a wise decision. There are personal coaches that can work with you. He or she can help you to identify your goals and steps to achieve them so you can become the best that you can be. Enter your email to get tips for finding a new career. © 2017 Career Tests Guide. All rights reserved.